It was a West Coast reunion of the Mountain Bike Hall of Fame at the Broken Drum Brewery in San Rafael. 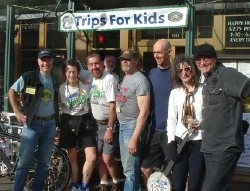 Mountain Bike pioneers Joe Breeze, Gary Fisher, Otis Guy, Charles Kelly, Michael Kelley, Mert Lawwill, Scot Nicol, Ned Overend, Jacquie Phelan, Tom Ritchey, Ross Shafer, and joined Trips for Kids at their annual Brews, Bikes, and Bucks fundraiser. In its eight year, the annual event has become a much anticipated occasion to meet the legends, socialize with fellow riders, enjoy live music, and support the national youth mountain biking program. Proceeds from the food and drink sales were generously donated by Noah Berry, owner of the Broken Drum. Throughout the afternoon, attendees were treated to a fun collection of bike schwag, including the grand raffle prize of a Jamis Dakar Sport full suspension mountain bike. For 18 years, Trips for Kids has been providing disadvantaged youth in the Bay Area with an opportunity to explore the wide open spaces on a mountain bike. Under the direction of Marilyn Price, herself a member of the Mountain Bike Hall of Fame, these popular rides offer personal challenges, build confidence, and expose youth to the pleasures of nature. There are currently 45 Trips for Kids chapters across the United States and Canada that together reach over 5,500 youth underserved youth each year. For more information about Trips for Kids (and in invitation to next year's event) visit their web site at http://www.tripsforkids.org or call (415) 458-2986. Mailing address: 610 4th Street, San Rafael, CA 94901. E-mail: tfkbike@pacbell.net. Photo left to right: Joe Breeze, Marilyn Price, Paul Sanford (Trips for Kids volunteer), Charles Kelly, Otis Guy, Jazquie Phelan, Gary Fisher.